With SJB SCRIP We All Win! Substitute Currency Reaps In Profits. 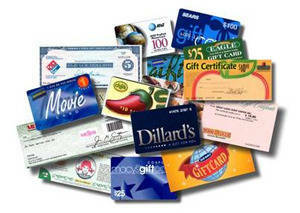 SCRIP is gift cards issued by many stores in our community and across the nation where you already shop regularly. SCRIP can easily work for your family. SCRIP cards are purchased dollar for dollar which means that if you purchase a $25.00 gift card it is worth $25.00 in cash at the establishment for which it is purchased. Our parish receives a percentage of each SCRIP card purchased. Plan to use SCRIP for your grocery, gas, restaurant, clothing and gift certificate purchases. Is SCRIP easy to use? Yes! Use SCRIP just like cash. There is no difference between SCRIP and cash when you go shopping, except you are using gift cards to purchase your items. There isn't one! That's the great thing about using SCRIP! It doesn't cost you a thing! You just have to think ahead and anticipate your needs so that you have SCRIP on hand when you're ready to go shopping. That's it! SCRIP online uses Presto Pay. How long will it take to receive my SCRIP order? • On-line orders (using Presto Pay) must be made by noon on Sunday for pick-up on Friday after 11:00 a.m. Contact the parish office at (812) 490-1000.